During the last decade, workplace wellness programs have become commonplace in corporate America. The majority of US employers with 50 or more employees now offer the programs. A 2010 meta-analysis that was favorable to workplace wellness programs, published in Health Affairs, provided support for their uptake. This meta-analysis, plus a well-publicized “success” story from Safeway, coalesced into the so-called Safeway Amendment in the Affordable Care Act (ACA). That provision allows employers to tie a substantial and increasing share of employee insurance premiums to health status/behaviors, and subsidizes such program implementation by smaller employers. The assumption was that improved employee health would reduce the employer burden of health care costs. Subsequently, however, Safeway’s story has been discredited. And the lead author of the 2010 meta-analysis, Harvard School of Public Health Professor Katherine Baicker, has cautioned on several occasions that more research is needed to draw any definitive conclusions. A wellness-sensitive medical event analysis tallies the entire range of primary inpatient diagnoses that would likely be impacted by a wellness program implemented across an employee population. The idea is that a successful wellness program would reduce the number of wellness-sensitive medical events in a population as compared to previous years. By observing the entire population and not just voluntary, presumably motivated, participants, or a “high-risk” cohort (meaning the previous period’s high utilizers), both self-selection bias and regression to the mean are avoided. Authors of a 2014 American Journal of Health Promotion (AJHP) meta-analysis stated: “We found a negative ROI in randomized controlled trials.” This was the first AJHP-published study to state that wellness, in general, loses money when measured validly. This 2014 meta-analysis, by Baxter et al., was also the first meta-analysis attempt to replicate the findings of the aforementioned meta-analysis published in February 2010 in Health Affairs, which had found a $3.27-to-1 savings from wellness programs. Another wellness expert, Dr. Soeren Mattke, who has co-authored multiple RAND reports on wellness that are generally unfavorable, such as a study of PepsiCo’s wellness program published in Health Affairs, dismissed the 2010 paper because of its reliance upon outdated studies. Baicker et. al.’s report was also challenged by Lerner and colleagues, whose review of the economic literature on wellness concluded that there is too little credible data to draw any conclusions. More often than not, wellness studies simply compare participants to “matched” non-participants or compare a subset of participants (typically high-risk individuals) to themselves over time. These studies usually show savings; however in the most carefully analyzed case, the savings from wellness activities were exclusively attributable to disease management activities for a small and very ill subset rather than from health promotion for the broader population, which reduced medical spending by only $1 for every $3 spent on the program. Whether participant vs. non-participant savings are due to the wellness programs themselves or are due to fundamentally different and unmatchable attitudes is therefore the key question. For instance, smokers self-selecting into a smoking cessation program may be more predisposed to quit than smokers who decline such a program. Common sense says it is not possible to “match” motivated volunteers with non-motivated non-volunteers, due to the unobservable variable of willingness to engage, even if both groups’ claims history and demographics look the same on paper. Further, passive non-participants can be tracked all the way through the study since they cannot “drop out” from not participating, but dropouts from the participant group—whose results would presumably be unfavorable—are not counted and are considered lost to follow-up. So the study design is undermined by two major limitations, both of which would tend to overstate savings. As an example of overstated savings, consider one study conducted by the Health Fitness Corporation (HFC) about the impact of the wellness program it ran for Eastman Chemical’s more than 8,000 eligible employees. In 2011, that program won a C. Everett Koop Award, an annual honor which aims to promote health programs “with demonstrated effectiveness in influencing personal health habits and the cost effective use of health care services” (and for which both HFC and Eastman Chemical have been listed as sponsors). The study developed for Eastman’s application for the Koop awards tested the participants-vs-non-participants equivalency hypothesis. From that application, Figure 1 below shows that despite the fact that no wellness program was offered until 2006, after separation of the population into participants and non-participants in 2004, would-be participants spent 8 percent less on medical care in 2005 than would-be non-participants, even before the program started in 2006. In subsequent presentations about the program, HFC included the 8 percent 2005 savings as part of 24 percent cumulative savings attributed to the program through 2008, even though the program did not yet exist. However, using participants as their own control is not a well-accepted study design. Along with the participation bias, it ignores the possibility that some people decline in risk on their own, perhaps because (independent of any workplace program) they at least temporarily lose weight, quit smoking, or ameliorate other risk factors absent the intervention. In sharp contrast, research by Dr. Dee Edington, previously at the University of Michigan, documents a substantial “natural flow of risk” absent a program. 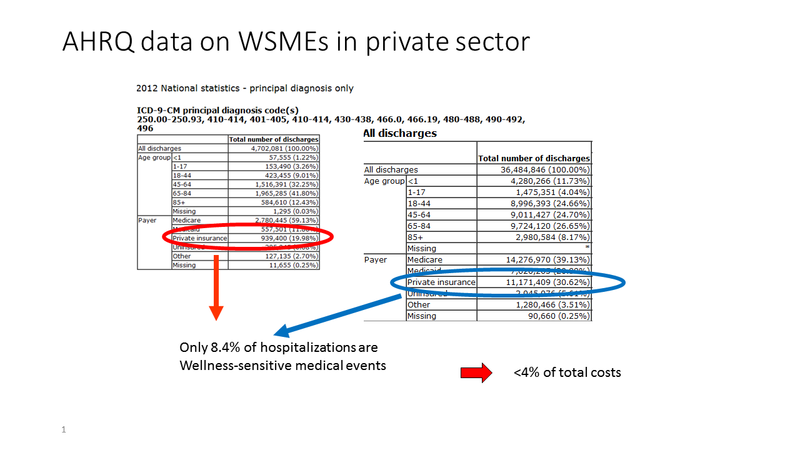 Data compiled by the Healthcare Cost and Utilization Project (HCUP) shows that only 8 percent of hospitalizations are primary-coded for the wellness-sensitive medical event diagnoses used in the BJC study. To determine whether it is possible to save money, an employer would have to tally its spending on wellness-sensitive events just like HCUP and BJC did. That represents the theoretical savings when multiplied by cost per admissions. The analysis would compare that figure to the incentive cost (now averaging $594) and the cost of the wellness program, screenings, doctor visits, follow-ups recommended by the doctor, benefits consultant fees, and program management time. For example, if spending per covered person were $6,000 and hospitalizations were half of a company’s cost ($3,000), potential savings per person from eliminating 8 percent of hospitalizations would be $240, not enough to cover a typical incentive payment even if every relevant hospitalization were eliminated. Second, there is no clinical evidence to support the conclusion that three pillars of workplace wellness—annual workplace screenings and/or annual checkups for all employees (and sometimes spouses), and incentivized weight loss—are cost-effective. The United States Preventive Services Task Force (USPSTF) recommends that only blood pressure be screened annually on everyone. For other biometric values, the benefits of annual screening (as all wellness programs require) may not exceed the harms of potential false positives or of over-diagnosis and overtreatment, and/or only a subset of high-risk people should be screened, as with glucose. Likewise, most literature finds that annual checkups confer no net health benefit for the asymptomatic non-diagnosed population. Note that in both cases, harms are compared to benefits, without considering the economics. Even if harms roughly equal benefits, adding screening costs to the equation creates a negative return. Third, much of wellness is now about incentivizing weight loss. In addition to the lack of evidence that weight loss saves money (Lewis, A, Khanna V, Montrose S. It’s time to disband corporate weight loss programs. Am J Manag Care. In press. February 2015), financial incentives tied to weight loss between two weigh-ins may encourage overeating before the first weigh-in and crash-dieting before the second, both of which are unhealthy. One large health plan offers a weight-loss program that is potentially unhealthier still, encouraging employees to use the specific weight-loss drugs that Dartmouth’s Steven Woloshin and Lisa Schwartz have argued in the Journal of the American Medical Association never should have been approved due to the drugs’ potential harms. Especially in light of these lawsuits, a viable course of action—which is also the economically preferable solution for most companies, and won’t unfavorably impact employee health—is simply to pause, demand that their vendors and consultants answer open questions about their programs, and await more guidance from the administration. A standard that “wellness shall do no harm,” by being in compliance with the USPSTF (as well as the preponderance of the literature where the USPSTF is silent) would be a good starting point. Tom, you may be right. With any luck this will be to wellness what the Armory Show was to art. Note that the true believers have been remarkably quiet, here and on Health Affairs and Insurance Thought Leadership. They usually muster a particular person to craft their response since most of the rest of them don’t understand math, but he won’t do it because we would simply point out his own myriad and obvious complicity in some mind-boggling ethical lapses. I hope we are seeing the end of bogus wellness claims.